If you didn't already know, the nomination period for TOKL's Annual Food Awards has BEGUN! - and you only have till Sept 18! From now till 18th September 2011 you can nominate/ vote for your favourite restaurants (, restauranteur & chef) - The fields are left blank so you can nominate whichever restaurant you like. Don't be put off that there are so many categories (18!) - you are allowed to vote for as many/ few as you want, even if you submit just one restaurant in one category. Check back (on Sept 20th?) to see if your favourite made it through to The Shortlist and cast your vote again to select the overall winner. 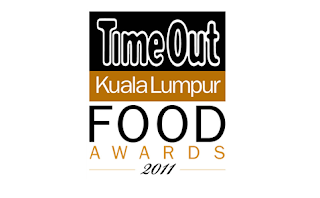 Results will be announced in the December ‘Food Awards Special’ Issue of Time Out Kuala Lumpur and on the main TOKL website shortly afterwards. I'll nominate for sure!Great job!